Published by: Brindle and Glass Publishing Ltd. Provided by the published in exchange for an honest review. To what extent are kids effected by their natural environment? There are things that every kid has in common, but culture differs for each child and their shared history and even the weather effects that. Linda Goyette set out to see how a child's environment and history changed their present in a number of locations around Canada in the Courageous Kids series. 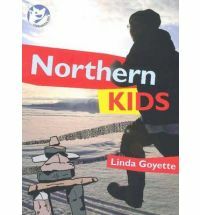 Northern Kids is one book in this series, now available as ebooks. The book features 24 stories of children from the late 19th century to the present day. Looking at events in history through the eyes of the children who truly lived them gives a child reader a connection to the people who formed their present culture. Goyette's research skills are superb, and it shows. You can tell she has a journalist's background because not only does she bring immediacy to all of the first-person stories, she is also capable of dividing the supplementary and contextual information from the emotions of the first-person accounts by adding her own framing article after the short nonfiction story, which is very effective. The story "Letter to My Mother and Father" was a particular favourite of mine. Just a short few decades ago, a young Inuit teen, Davidie Pisurayak Kootook, wrote a letter to his mother and father in Inukitut, after surviving a plane crash with only the pilot in the northern bush. He sacrificed himself so the pilot with broken legs could survive the weeks before help arrived. Courage was also shown by kids in a number of other stories including Ella Day and her family in Fire and a chief's son confronting a newfangled invention in The Photograph, as well as a young boy's pet dog in The Swimmer. My own kids are younger than the audience this is aimed at, but the stories are short and understandable, so they enjoyed a few, especially Up In My Bunk Bed about traditional beadwork, and Too'Oh Zrii and the Bear, about a confrontation with a bear and oral storytelling, and of course the story about dog mushing. They also really enjoyed the archival photographs Goyette included. One of the best things about this book from a parent's perspective, especially as I will be using books like this to afterschool my children in Canadian social studies, is the supplemental materials provided for teachers by Brindle and Glass at the Courageous Kids website. I will be using these materials over the next few years! This book covered a lot of very difficult subject matter, including disease, starvation, and some of the worst mistakes in Canada's history such as the residential schools and the reprehensible way Canada is still treating the schools and people of Attawapiskat. The guide prepared helps non-professionals like me cover these issues with my children. The other books in the series are Kidmonton, Rocky Mountain Kids, Island Kids, and the latest, Vancouver Kids. I chose this one just to continue in yesterday's theme of reading about cool and/or scary things to cool yourself down in a hot summer. This post is for Nonfiction Monday, hosted this week at the Jean Little Library. This is the seventh book I have reviewed for the Sixth Canadian Book Challenge. One of the kids in that book was a student of mine. Also, you might want to read Margaret Macpherson's "Body Trade" which uses Kootook's story as a backdrop. They sound brilliant books - off to look them up now. I ordered the sample on Kindle! This looks like a promising series. Thanks!